U.S. Air Force F-35 Heritage Flight Team perform for the first time in Toronto at the 2018 Canadian International Air Show. An ability to drop US-made B-61 nuclear bomb besides stealth features that sharply reduce the aircraft’s radar signature were the two key factors which made Brussels select the Lockheed Martin F-35 over the Eurofighter Typhoon. WASHINGTON — The F-35 Joint Program Office temporarily has halted flight operations for a number of F-35s with higher flight hours after finding two new parts that will require inspection on older models of the jets. further proof that if LockMart and Japan go F-22 2.0, there is no reason to go with OVT, LockMart has demonstrated outstanding "pitch rates" without OVT.. So when people say yeah, but the F-16 will do these same types of turn-outs? that's true to a point, and that point is when this aircraft is slowing to a near stand still, it is still safe and highly maneuverable,,, that my friend is where the Falcon would happily "depart" and eat your lunch. Equation and timepass like this. The German Air Force and electronics specialist Hensoldt are gearing up to deploy a new sensing technology in southern Germany that promises to target enemy aircraft without pilots knowing they are being tracked. In this case, probably the F-35B bombing something in Afghanistan from the USS Essex. Syria will probably be for the next deployment of an ARG, IMO. So now we have the Wasp, Essex, and America launching Bravo's?? Jeff or Bd?? or anyone, is the third ship the America? 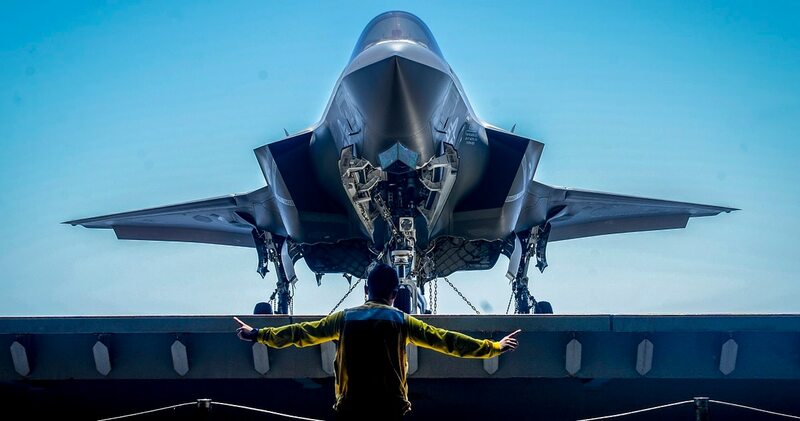 My neighbor kid is a Marine serving aboard the Essex as an F-35 Bravo maintainer, I copied this picture Jura to give to his wifey this morning! its a great picture! Equation and Jura like this. but, hey, "The government has not finalized the cost for the new plan, “but we are very close to that,” Pentagon acquisition executive Ellen Lord told Aviation Week Oct. 19 en route to Luke AFB, Arizona." Are US made military assets tracked around the world via GPS or something? Are there remote kill switches?